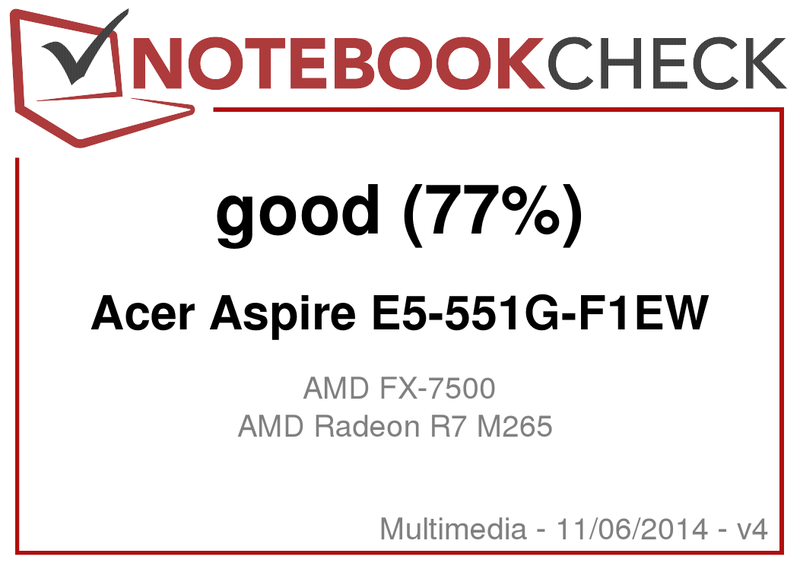 After testing the Aspire E5-551 a few weeks ago, we now have our hands on the Aspire E5-551G, with a dedicated GPU. Both Aspire models are equipped with APUs from AMD. 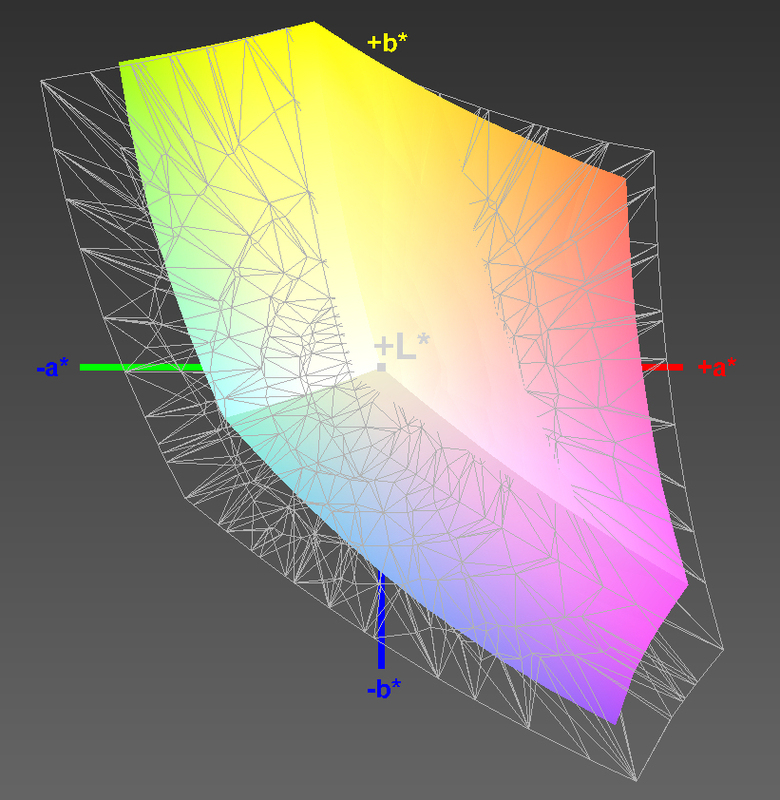 The "G" model should cope a lot better with computer games, making it a decent all-rounder. Our test report reveals whether that is true. 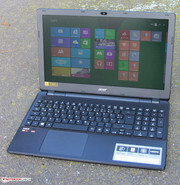 Competitors of the Aspire are the all-rounders from other manufacturers in a price range of around 600 Euros (~$748). 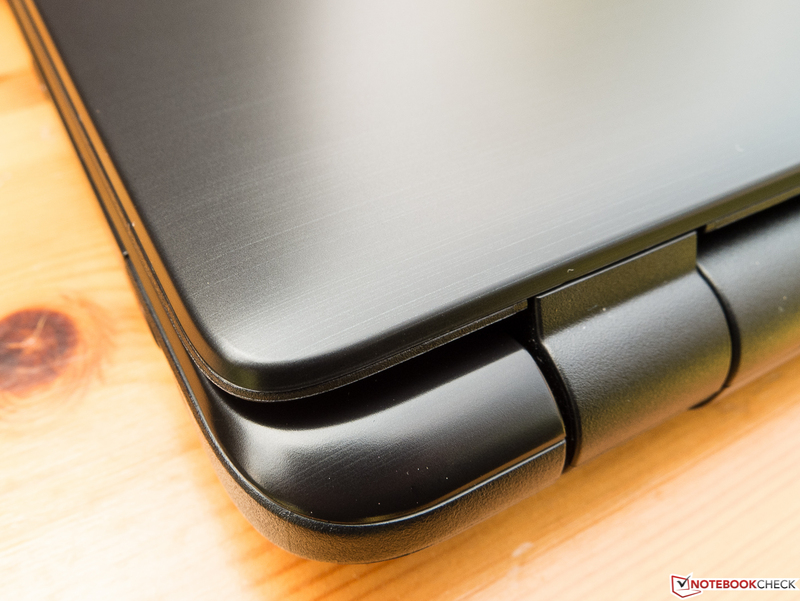 Examples would be HP's Pavilion 15-p008ng and Dell's Inspiron 15 3542-2293. 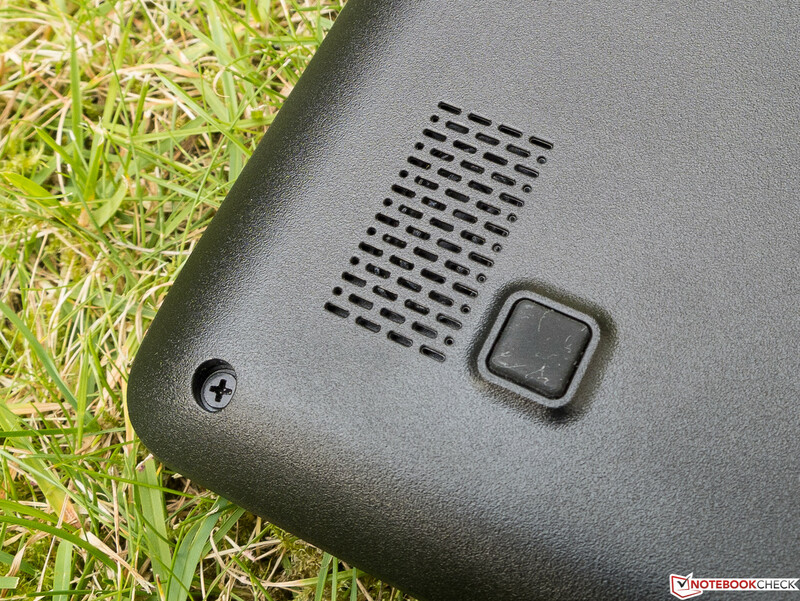 Since both Aspire E5 models feature an identical build, we will not go into details about casing, connectivity, input devices, and the speakers. 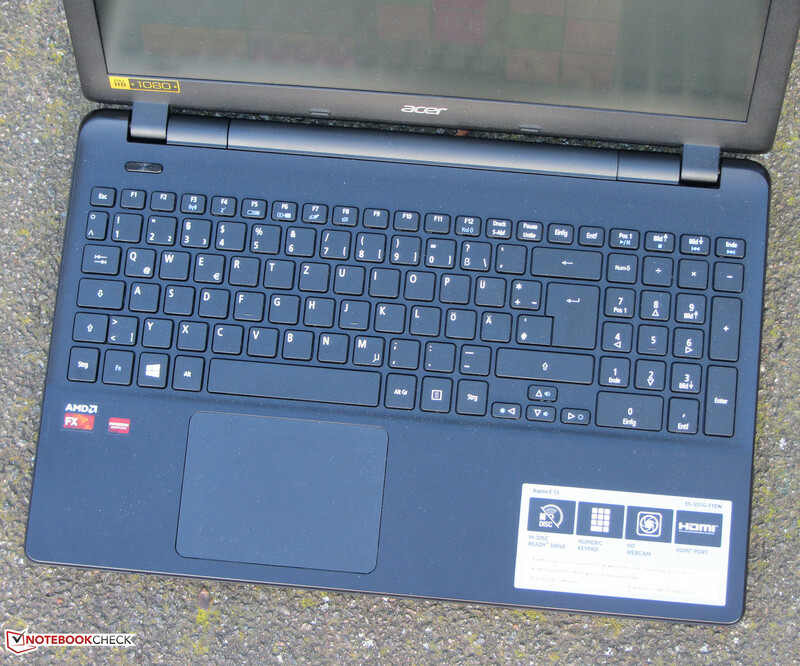 The relevant information can be found in the review of the Aspire E5-551. The 15.6-inch screen of the Aspire features a matte surface and a native resolution of 1920x1080 pixels. A brightness of 249.6 cd/m² is absolutely acceptable, and corresponds to our minimum expectations of a modern day screen. The screen in the Pavilion (329.4 cd/m²) is much brighter, and the Inspiron (211 cd/m²) lags behind its rivals. 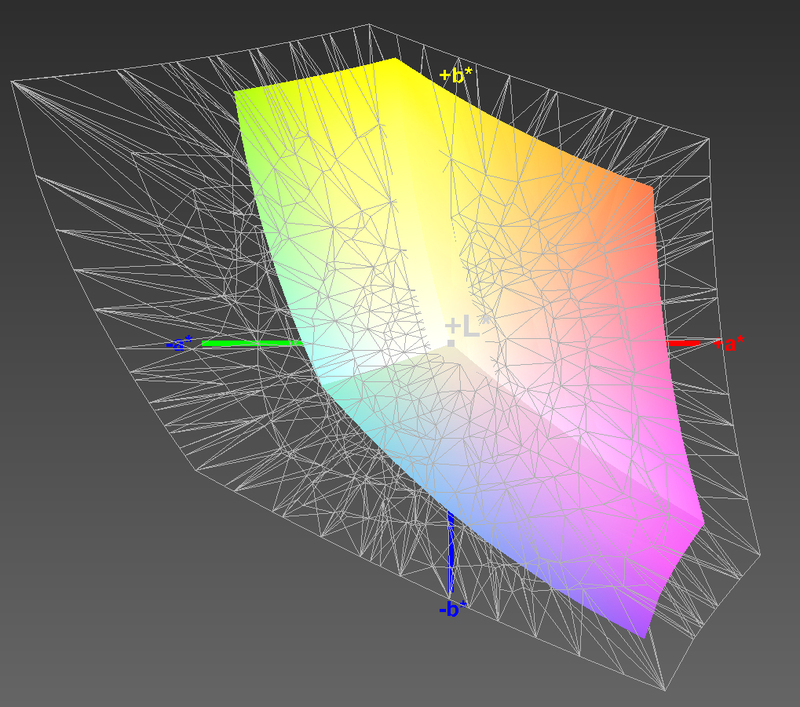 Both the contrast ratio of 403:1, and black level of 0.63 cd/m² are quite decent. Nevertheless, laptops in this price range should definitely have a contrast ratio of beyond 500:1, such as the Inspiron 15 3542 (691:1; 0.33 cd/m²). The Pavilion's screen (336:1; 1.02 cd/m²) has the poorest rates among the comparison devices. The Aspire's screen cannot reproduce either the AdobeRGB or sRGB color spaces. The coverage rates here are 50% (AdobeRGB), and 72% (sRGB). The screen does not show any surprises in terms color reproduction. It has an average DeltaE 2000 shift of 9.71 in state of delivery - a common rate in this price range. A rate less than 3 would be desirable. The screen also exhibits a clear bluish cast. 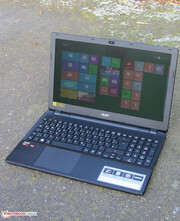 The screen's matte surface and decent brightness allow using the Aspire outdoors. 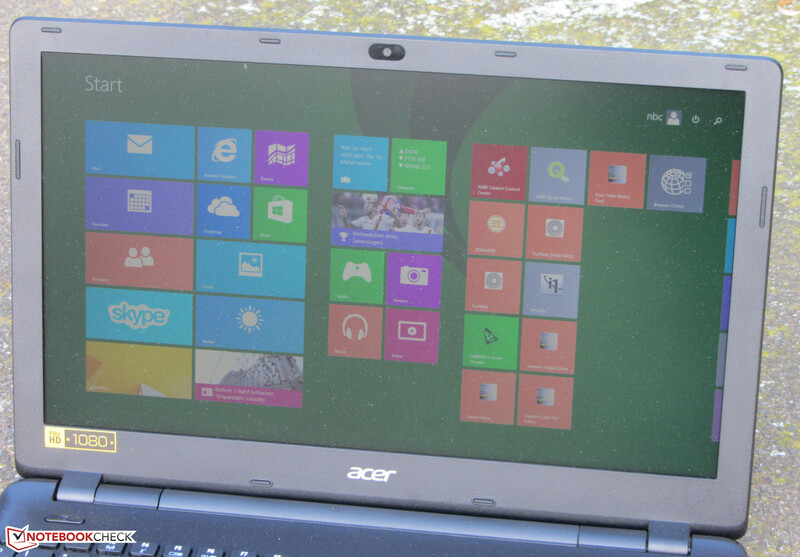 However, since Acer installs a TN screen in its Aspire, the laptop can only serve with limited viewing angles. 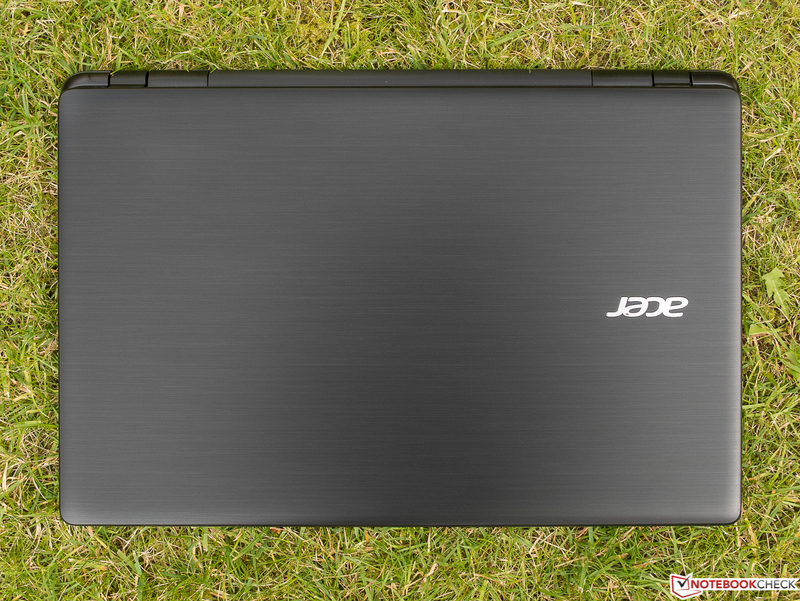 Acer's Aspire E1-551G is an affordable, 15-6-inch all-round laptop. 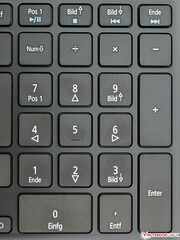 It provides enough computing power for routine tasks, and can even be used for playing computer games. Our review sample is sold for approximately 599 Euros (~$747). Other configurations are also available. The Aspire is powered by AMD's FX-7500 APU (Kaveri). The CPU part of the APU consists of four processor cores that clock with a base speed of 2.1 GHz. The speed can be accelerated up to 3.3 GHz via Turbo. The APU's TDP of 19 Watts is slightly higher than that of Intel's Haswell ULV processors (15 Watts). Like the processor in the recently tested ThinkPad E555, the Aspire's APU cannot develop its full processing power. The single-thread tests of the Cinebench benchmarks were performed with 2.5 to 2.8 GHz, and it processed the multi-thread tests with 1.9 to 2.5 GHz. The processor clocked with stable 2.1 GHz when the tests were performed in battery mode. All in all, the processor's performance is on par with Intel's Core i3-4010U processor. If AMD's APU could max out its Turbo, it would outperform Intel's processor - abundantly clear in multi-thread applications. The system runs smoothly. We did not experience any difficulties. The PCMark benchmark scores are also very good. Aspire buyers will not find themselves wanting more storage any time soon. 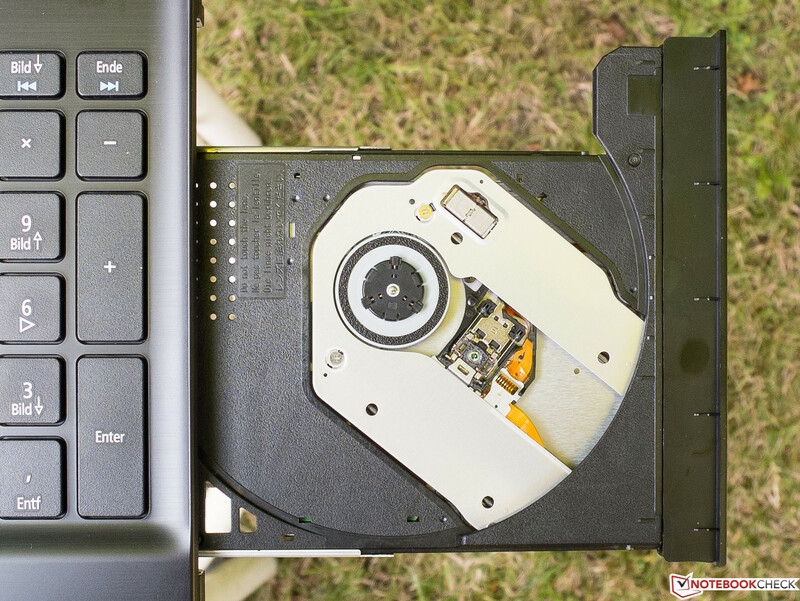 The hybrid hard drive provides a capacity of 1 TB, and spins with 5400 revolutions per minute. The drive is supported by an integrated 8 GB SSD cache that ensures fast loading of frequently used applications. The drive's transfer speeds are good overall. One final note: The recorded HD Tune access time to the drive varied greatly every time that the tool was run. This is due to the SSD cache. The Aspire is equipped with two graphics cores - the integrated Radeon R7 (Kaveri) chip, and the dedicated Radeon R7 M265 GPU. At a first glance it is not clear whether the cores operate in a Crossfire array (dual-graphics), or an Enduro array (graphics switching). Acer could not give us a clear answer concerning this either. Looking at the configuration menu and the scores of our multiple benchmarks, we assume it is an Enduo array. The integrated GPU is enabled in routine use and battery mode, and the dedicated GPU is used when high graphics performance is needed, such as in games. Both GPUs support DirectX 11.2. The Radeon R7 M265 graphics core is a mid-range GPU. It clocks with speeds of up to 825 MHz. The 3Dmark benchmark scores are roughly on par with other laptops that feature the Radeon R7 M265 chip, for example the Aspire V5-561G and Aspire E1-572G. The extremely minor lag of the Aspire is due to the slightly weaker APU. The Aspire renders many games in the HD resolution (1366x769 pixels) smoothly, using medium to sometimes high quality settings. However, the laptop reaches its limits in performance-devouring games like Ryse: Son of Rome or The Evil Within. 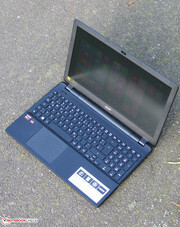 Comparing the Aspire with other laptops that feature the Radeon R7 M265 graphics core and an Intel processor, shows that the Aspire marginally lags behind these laptops. Such laptops achieve higher frame rates, partially due to their stronger processors. 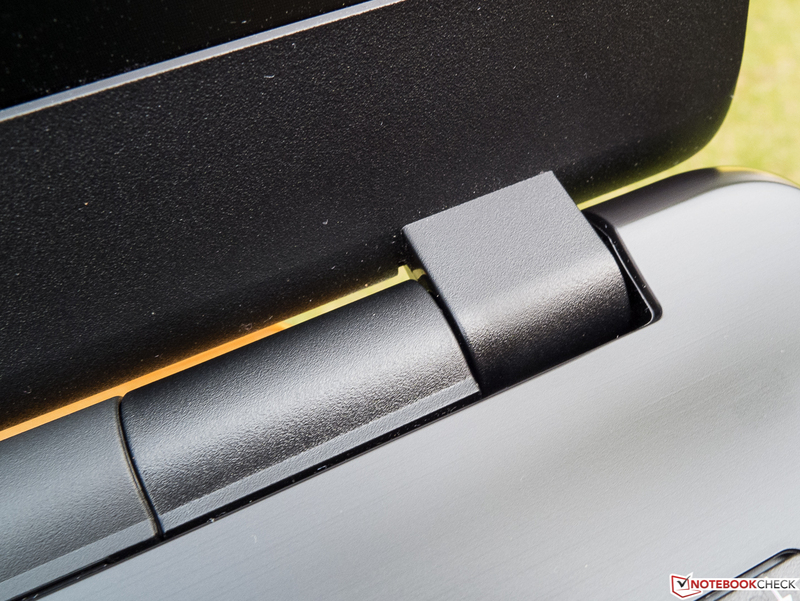 HP's Pavilion 15-p008ng would be an alternative for the Aspire when more gaming power is needed. HP's laptop is about the same price as the Aspire, and also features a matte, Full HD screen. The Aspire is virtually silent while idling. The fan spins with low speeds, and the hard drive operates quieter than the fan. The Aspire does not produce too much noise, even during load. The noise development is absolutely acceptable considering the laptop's computing power. Both the Pavilion 15-p008ng and Inspiron 15 produce more noise under full load because - unlike the Aspire - neither the CPU nor GPU are throttled. The Aspire performed the stress test (Prime95 and FurMark run for at least one hour) differently in AC and battery mode. 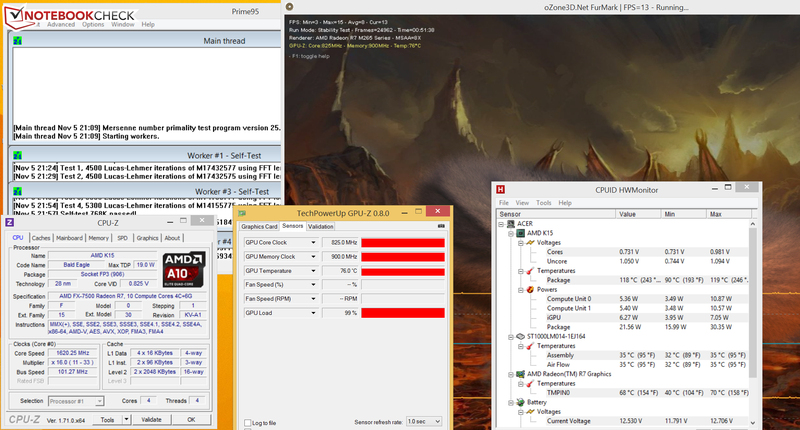 The graphics core clocked with its full speed in AC mode (825 MHz). The APU ran with 1.1 to 1.9 GHz in AC mode. The speed dropped to 1.1 to 1.6 GHz as the test progressed. The GPU was throttled to 300 MHz when the laptop ran on battery power. The processor clocked stably with 2.1 GHz. Although the APU's speed was throttled during the stress test (AC mode), the temperature on the casing exceeded fifty degrees Celsius (~122 °F) at some measuring points, Competitors like thePavilion 15-p008ng and Inspiron 15 3542 do not heat up as much. The Aspire also presented higher temperatures than its rivals while idling. Laptops like the Pavilion 15-p008ng and Inspiron 15 3542 that feature Haswell ULV processors, have an idle power consumption below 10 Watts. The Aspire cannot compete with that here. The idle power consumption of Acer's laptop ranges from 10.2 to 16.3 Watts. The Aspire also consumes more power than its rivals in medium load (via 3DMark 06), and full load (stress test via Prime95 and FurMark). It is interesting to know that the Pavilion has more CPU and GPU power than the Aspire. The Aspire's battery lasted for 6:08 hours while idling. The Pavilion (8:41 h), and Inspiron (13:53 h) achieve considerably better runtimes. The idle mode is measured with Battery Eater Reader's test using minimum screen brightness, the energy saving profile and disabled wireless modules. The Aspire shut down after 1:49 hours of load. Both the Pavilion (1:40 h) and Inspiron (1:41 h) are close behind. The load runtime is determined with Battery Eater Classic test. The screen's brightness is set to maximum, the High Performance mode and wireless modules are enabled. Acer's laptop lasted for 4:32 hours during the Wi-Fi test . The Pavilion (4:45 h) and particularly the Inspiron (6:11 h) score better here. 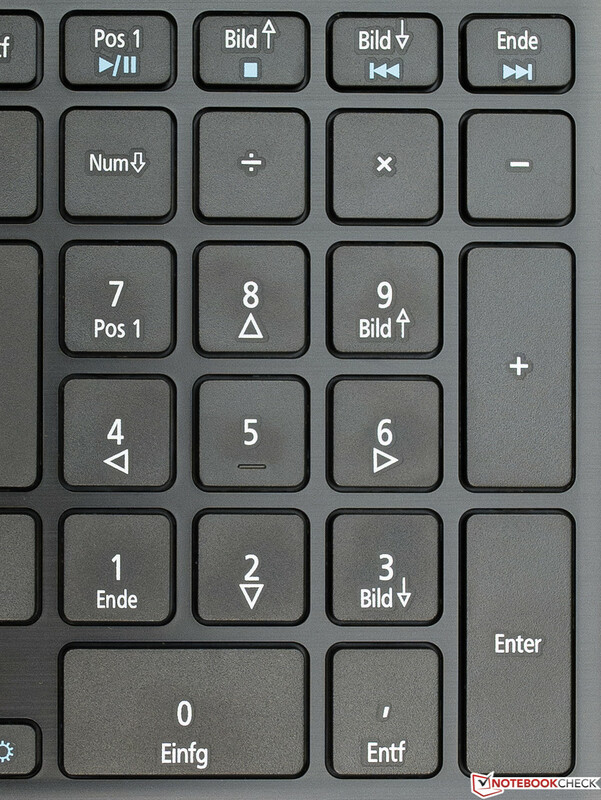 Websites are opened automatically every 40 seconds using the energy-saving profile and a screen brightness of approximately 150 cd/m² in this test. We check the video playback time by running the short movie Big Buck Bunny (H.265 encoding, 1920x1080 pixels) in a loop. The energy saving profile is enabled and the screen's brightness is set to approximately 150 cd/m². The Aspire managed 3:32 hours. Again, both the Pavilion (4:47 h) and Inspiron (6:05 h) clearly do a better job. On the whole, the battery life is still satisfactory. However, it has to be called poor considering the battery capacity (Acer: 56 Wh; HP: 41 Wh; Dell: 40 Wh). The Aspire's high idle power consumption takes its toll here. The possible battery runtimes can be seen based on the recently tested Acer Aspire V3-572PG-604M (Core i5-4200U, GeForce 840M). 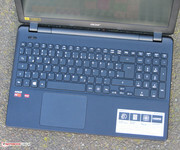 It is equipped with the same battery as the Aspire E5, but has more computing power. It achieved a runtime of 8:02 hours in the practical Wi-Fi test. 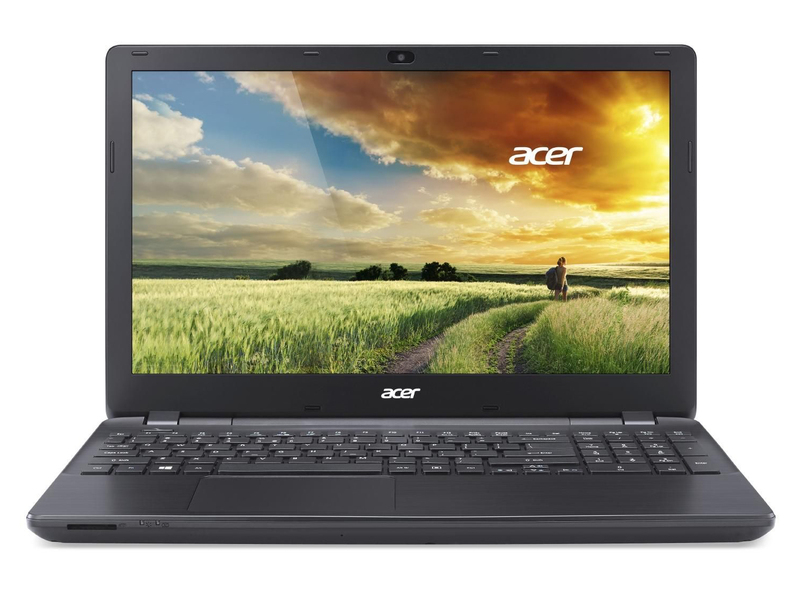 The Aspire E5-551G-F1EW is a 15.6-inch all-round laptop. It has enough computing power for everyday use, and can render games smoothly. There is no lack of storage thanks to the 1 TB hard drive. In addition, the laptop usually runs quietly. The matte, Full HD screen is also very pleasing. Nevertheless, the rates could be a bit better. 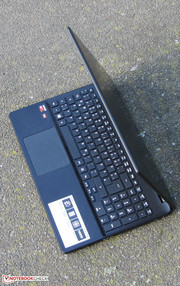 The idle power consumption is too high, and consequently the laptop shows shortcomings in its battery life. Users who do not place much importance on battery runtimes, can confidently opt for the Aspire. HP's Pavilion 15-p008ng is an alternative when more gaming power is needed. 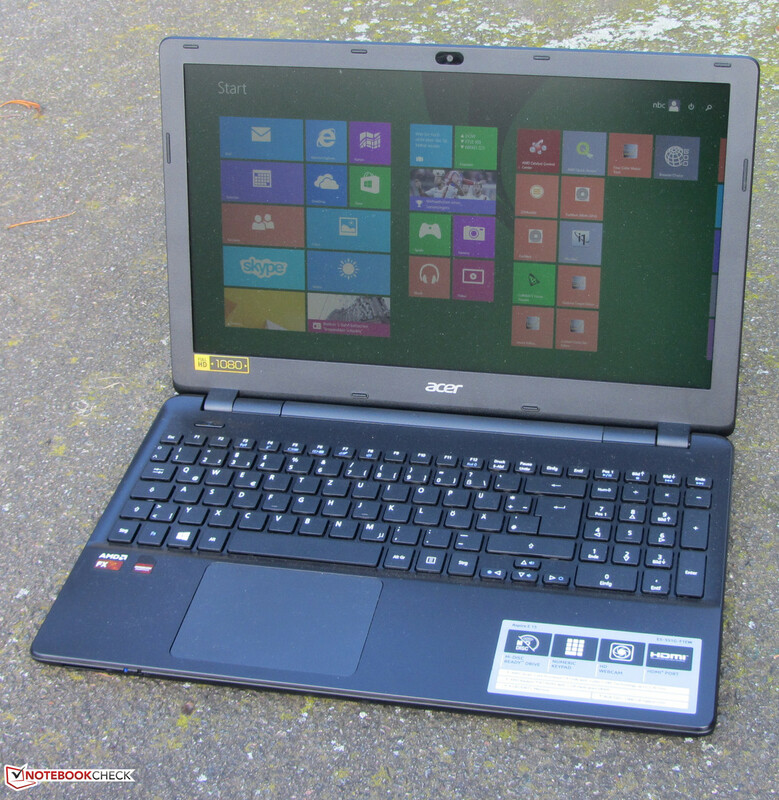 Like the Aspire, the laptop costs 600 Euros (~$748; including Windows 8.1) and also features a matte, Full HD screen. 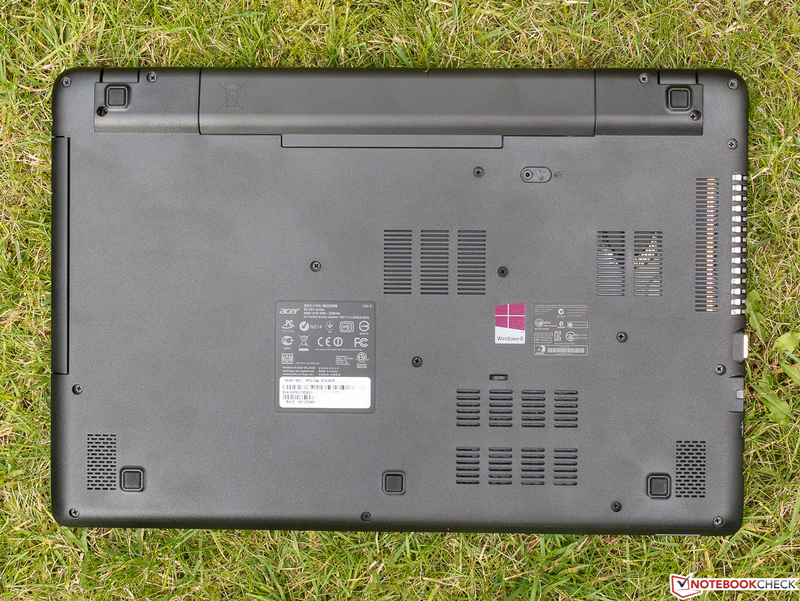 Dell's Inspiron 15 3542-2293 has more CPU power and a longer battery life than the Aspire. Beyond that, it is cheaper than its rivals with a price tag of approximately 530 Euros (~$660). The entire casing is comprised of plastic. It even has a DVD burner. The speakers are on the devices' underside. The battery has a capacity of 56 Wh. The matte, Full HD screen. A longer battery life and a lower idle power consumption.